I will be hosting Christmas this year. It has been a busy few weeks since the end of October and I have still got a lot of catching up to do in other areas. My siblings and I take it in turn to host the various holidays through the year so that the bulk of the work does not fall on any one family for all holidays or the same holiday every year but more importantly so that every family gets to enjoy the preparation. Typically I do a buffet style lunch for Christmas when there is a larger group and everyone is free to sit in the family room, living room or at the kitchen table. This year I have decided to do a sit-down meal - 8 adults at the dining room table and 5 kids at the kitchen table. The food will be laid out on the kitchen island. My dining room colors have changed and therefore I have to keep that in mind when setting up the dining table. I do not have time to go shopping for decorative items for the table and neither do I want to spend money unnecessarily. 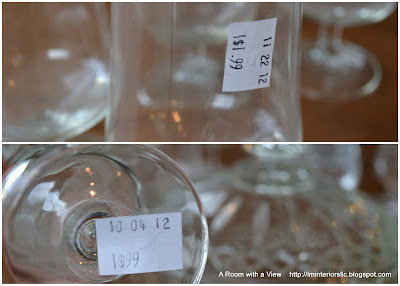 I paid a visit to a local Salvation Army last week in order to look for some glassware I could repurpose. It is amazing what one can find in any local consignment or thrift store. This is what I came away with. The glass with the 'X' is my own glass of water which I had forgotten was on the table at the time. These candleholders have some scratches but could easily be repainted to look as good as new. I love the shape and the height of these 6" juice (?) glasses (on the right). The single piece on the left is probably a vase. These 7" beer glasses were also in perfect condition. Apparently, if an item is on the shelves for more than 2 weeks at the Salvation Army the price is reduced by 50%. Perhaps this holds true for other such stores. I spent just over $20 for thirteen pieces. These came in at half the sticker price. Note the date the items went on the shelves is also stamped. One of my favorite items which is perfect to have out on display with some candy at the time of year is this crystal dish with lid. I am considering spray painting the beer and juice glasses to use as bud vases along the dining table. I have been scouring Pinterest for inspiration although I have some idea what I want to do. This mini project has to be quick and relatively easy - just 2 weeks to Christmas! And I have to find a non-rainy, non-windy day to spray paint!